This wonderful card was been sent by the couple I have supported one day. It was a card from TAKETOMI island during the trip of YAESHIMA islands. 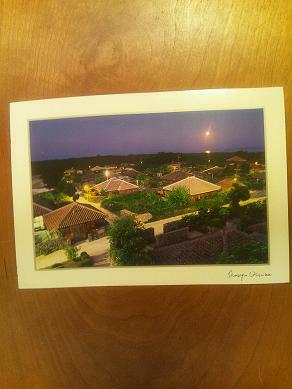 The letter “OKINAWA TAKETOMI island” written on the postmark and the picture of the village peculiar to the Okinawa made me very glad!! Also, it was happy to know that they have written to me during their relaxing and special time. I have never been to Taketomi island, but the scene drawn on the card and the words from the couple, “If you have an opportunity, please go with husband” made the Taketomi island as my next place to visit. Mr and Mrs S, thank you for the brilliant card.